Many people wonder if an item stored in the attic or found at a tag sale could be a lost treasure. Joe Nickell’s latest book, Real or Fake, offers a general introduction to the principles of authentication. Illustrating methods used by the pros and recognized by hit shows such as Antiques Roadshow, Nickell educates readers with the specific information necessary to begin forgery detection. 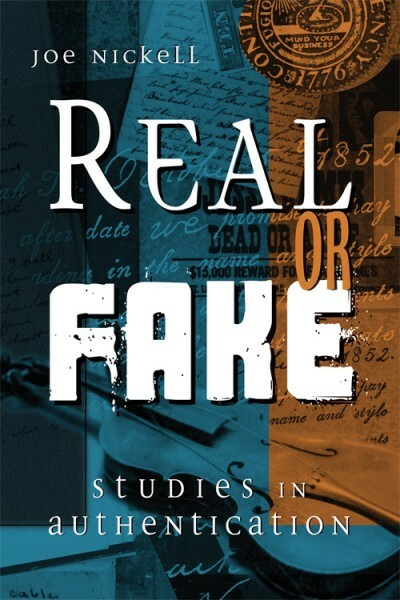 Real or Fake focuses on three categories of potential treasures: documents, photographs, and other artifacts. Nickell critiques famous examples from each group to explain how his suggested techniques can be used to unmask fakes. The objects examined and tested for authenticity in the book include Jack the Ripper’s diary, a draft of the Gettysburg Address, notes by Charles Dickens, a film of an alien autopsy, and debris from the Titanic. Nickell’s extensive knowledge of the field is accessible to everyone—from the general reader to the aspiring scientist—who wants a better understanding of how the experts determine if a suspicious heirloom is real or fake.